With October just around the corner I saw it fitting to review one of my all time favourite Horror comedies. There are some films that you give credit to for getting you into the genre, for me this is one of them. I first saw it on VHS at a friends house at a sleepover, I was so captivated by it that I ended up borrowing it to rewatch it. It came along at a perfect time in my life, it was a perfect mixture of humour and Horror and a film I've long classed since as a great starting point for young teens to get into Horror (despite it's R rating, 15 in the UK). The casting for this film was amazing, Fox was a perfect fit for the role of 'Frank Bannister' and it's a true shame his career got cut short. Another perfect fit was Combs as 'Milton Dammers', a character who creeped me out for years and still freaks me out when I watch it. The film was wrote and directed by Peter Jackson, his last for into Horror. I seriously hope that one day he decides to come back to the genre as he just gets it, go back and watch his Horror stuff and tell me I'm wrong. 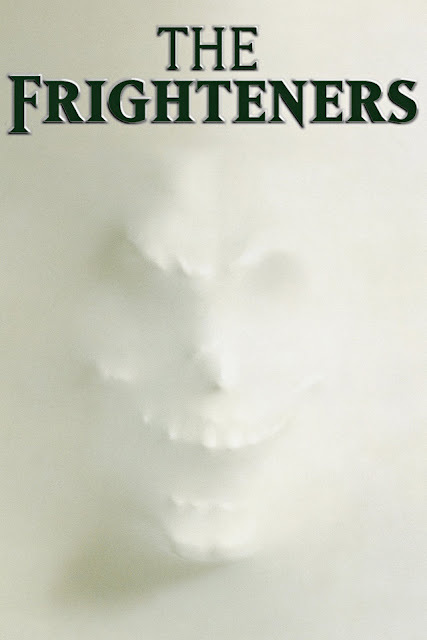 "The Frighteners" is a fantastic film, a must see, and it's the perfect time of year to watch it. Was originally planned as a Tales from the Crypt (1989) feature, but producer Robert Zemeckis liked the script so much, he decided it should stand on its own and not be part of a series. No other actor was considered for the Frank Bannister role other than Michael J. Fox. Peter Jackson and Fran Walsh were having a meeting with Robert Zemeckis about the film and his name came up. Jackson liked the idea, and sent the script to Fox. Danny Elfman was so impressed with Peter Jackson's previous movie, Heavenly Creatures (1994), that he offered to do the score for one of Jackson's next movies, and agreed to this movie without even knowing what it was about. It was during filming this on location in New Zealand that Michael J. Fox made up his mind that he'd had enough of being away from his family making movies and decided to head back to the small screen and star in a new sitcom (Spin City (1996)). This turned out to be his last leading role in a film. Peter Jackson and Robert Zemeckis unsuccessfully campaigned to have the film released in October 1996 for Halloween week. The studio however wanted it for a summer release. The move ultimately backfired as it didn't do well in gross earnings. It was Jeffrey Combs who suggested the Adolf Hitler-inspired haircut for his character, to show Milton Dammers' extreme sense of nationalism after serving his country for so long. Combs also suggested two ear appliances, which made his ears stick out quite comically, and several of Dammers' chest tattoos. Melanie Lynskey and Kate Winslet are visible on the cover of the serial killer video that Lucy watches, recreating a famous photo of their real-life characters from Heavenly Creatures (1994), Peter Jackson's previous film. From the second-half of the film onwards, Lucy (Trini Alvarado) wears only one outfit - the pink shirt. It eventually became a running joke throughout the film such that on the last day of her schedule, the crew presented her a Barbie doll with the Lucy-dressed outfit as a gift. Michael J. Fox performed many of his own stunts in the film. Ironically he broke his foot by a simple fall whilst filming in the forest at night. Peter Jackson said Fox's injury was actually a blessing in disguise because it allowed him to work on the script some more, and edit some of the film's scenes while Fox recovered for a week. When Fran Walsh and Peter Jackson were writing the part of the Drill Sergeant in the graveyard, they wrote the part as a spoof of R. Lee Ermey's character in Full Metal Jacket (1987) with the intention of getting an actor in New Zealand for the role. But they didn't feel the actors who auditioned were right and finally ended up approaching Ermey himself. Peter Jackson loved Jeffrey Combs' work on the Re-Animator (1985) movies so much that he asked the casting director to find out whether Combs was still available and working (he was unsure). Fortunately, Combs was available and signed up. He wore black contact lenses for his role. Chi McBride agreed to be in The Frighteners, after seeing Peter Jackson's Heavenly Creatures (1994). As an inside joke, the black-and-white footage of Johnny Bartlett's trial contains many cameos of crew members on the picture. The 'Russian cannibal creep' referred to by Bartlett is Andrei Chikatilo, really a Ukrainian. Weta Digital Ltd, Peter Jackson's special effects company, had to expand their capacity from 1 to 35 computers in order to meet the visual effects demands for this movie. However, they had good use for them afterwards, as their next project was the very special effects-heavy trilogy The Lord of the Rings: The Fellowship of the Ring (2001), The Lord of the Rings: The Two Towers (2002) and The Lord of the Rings: The Return of the King (2003). Charles Starkweather, the real life killer referenced in the movie, killed 11 people (and 2 dogs) during a nearly two month killing spree. His 14-year-old girlfriend (Carillon Ann Fugate) accompanied him for, and participated in most of the killings. He was caught, tried, convicted, and executed (by electric chair), in a seventeen month span. Caril Ann Fugate was not executed, but sentenced to a "Life" term in prison. She was paroled after serving 17 years in prison. Trini Alvarado sustained so many bruises working on the film, receiving new ones almost every day, that the make up department would take pictures for future reference. Tom Cruise and Matthew Broderick were considered for the part of Frank Bannister if Michael J Fox turned down the part. 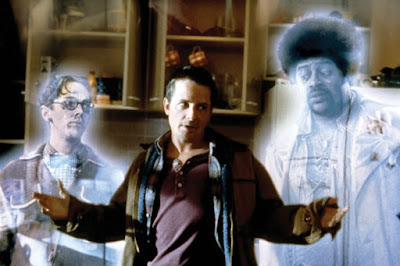 When Frank's ghost friends attack the Lyskey residence, a mini statue of Elvis Presley floats in front of Ray. Peter Dobson, who plays Ray, previously appeared in Forrest Gump (1994) as Elvis Presley. The shooting script originally included another character at the cemetery called the Gatekeeper, a big chubby angel who would be acting as the cemetery's guardian. A large Gatekeeper prop was created and some scenes with him were actually filmed. However, these were omitted from the film, as director Peter Jackson couldn't really find a good explanation for the angel's presence. Most of its role was taken over by the Sgt. Hiles character (R. Lee Ermey). When Frank is at Ray and Lucy's house, he opens the refrigerator and freezer to squirt holy water inside. No light comes on when either door is opened. The shotgun Patricia Bradley uses at the end is a Mossberg 590. The revolver Milton Dammer uses is a Charter Arm's Bulldog. Melanie Lynskey: star of Peter Jackson's Heavenly Creatures (1994) makes a cameo, she is the deputy taking Lucy Lynskey's statement at the police station. Also Lucy's last name is a reference to the actress as well. Billy Jackson: 3-month-old son of director makes a cameo as a levitated baby. In order to trick the audience into believing that Patricia Bradley was innocent of the Fairwater murders, Peter Jackson specifically wanted Dee Wallace for the part. He figured that her role as Elliot's mother in E.T. the Extra-Terrestrial (1982) was about the sweetest character you could find, and therefore no one in the audience would suspect her. Dammers' (Jeffrey Combs) death scene was made extra gruesome when it was clear that the MPAA was going to give the movie an 'R' rating instead of the PG-13 rating the makers were aiming for. He originally died of a shot in the chest, which was changed in post-production to his head exploding. Johnny Bartlett" is named after Velda and Marion Bartlett, the second and third victims of Charles Starkweather, who murdered 11 people throughout Nebraska and Wyoming in 1958, accompanied by his his 15-year-old girlfriend, Caril Fugate, whose precise role in the killings is not known. The story has been dramatized in Badlands (1973) and other movies. In the film, the Johnny Bartlett character names Starkweather as his role model. Strangely, Starkweather and the victims Bartlett are buried together in Wyuka Cemetary, Lincoln, Nebraska. The first name of Patricia Bradley (Dee Wallace) provides a hint to her criminal past, revealed later in the film. She is named after Patricia Hearst, also known as Patty Hearst, a girl who was taken hostage by an urban guerrilla group, then brainwashed into sympathizing with her kidnappers and helping them rob banks.